The leader of the Catholic Church in England and Wales has spoken out about the historic ban on any heir to the throne marrying a member of his church. 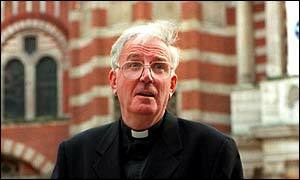 The Archbishop of Westminster, Cormac Murphy O'Connor, called for a repeal of the age old ruling. He made his comments before taking part in a multi-faith service at Windsor to mark the Golden Jubilee. It's not really and shouldn't be relevant in today's world and today's Britain. At the ecumenical service at St George's Chapel, the Queen witnessed religious leaders signing a covenant expressing their unity. Church services have been taking place across the country on Sunday to commemorate the Queen's 50 years on the throne. The Archbishop said the 1701 Act of Settlement governing the marriage of the heir, discriminated against the Royal Family themselves. A future monarch should be free to marry whoever he or she wanted, he said. Speaking on Sky News with Adam Boulton on Sunday he said: "I think with regard to the Act of Settlement, it's not really and shouldn't be relevant in today's world and today's Britain. Prince William "should marry who he wants"
"After all, it's not so much that it is an act of discrimination against Roman Catholics - which it is - but it seems to me to be discrimination against the Royal Family." He said the present law needed changing so that Prince William could marry someone of any faith. "I think the future monarch should be able to marry who he wants," he said. "Talking about Prince William, he can marry by law a Hindu, a Buddhist, anyone, but not a Roman Catholic. "That seems to me anomalous and I think it should go."